Those pesky console switches ! Sticky windows, hazard lights and the like. Actually getting them back into prime condition isnt hard or difficult or even tedious. Just did all my window switches and took a few pics while doing it. Emery board if they are really corroded, mine werent. I used Tarnex to clean the contacts. 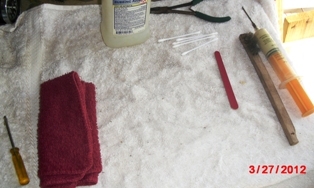 Rubbing alcohol used to clean and as a final rinse. Lube applicator of some kind. 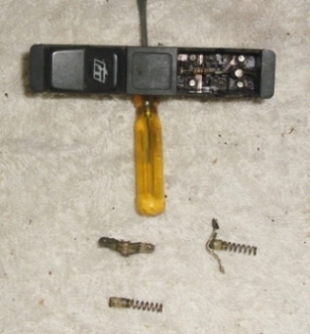 BBQ skewers are nice for cleaning out the lower switch parts. The pics show the entire work area. A clean towel prefer a fluffy one as some of the parts like to fly. Last edited by TnBob; 03-27-2012 at 11:05 PM. Please remember the plastic and wood parts are around 30 years old. Take your time and be gentle. 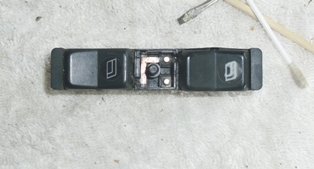 Get the console piece pulled back and raised. The switches wont allow much lift and I found the drivers side best to start with. 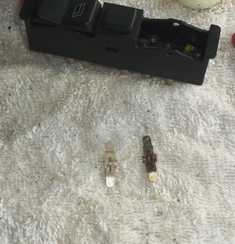 Removing the switches is done by pressing in at the top of the switch end on the metal retaining clip. Push it in with the screwdriver and give a slight push up on the switch bottom. Both ends will need to be done. 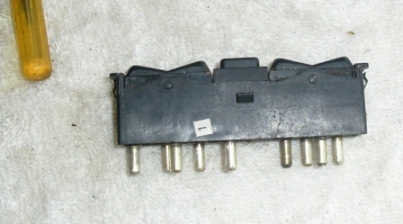 This is after the wire connectors are removed from the switch bottoms. Once out of the console I labeled mine (1) just as habit. On the bench I first wire brushed the metal clips. Next slide the screwdriver blade down into the side of the switch which will allow the rocker pin to pop out of the switch housing. Again both sides need to be done. All versions I have seen of this switch are spring loaded. Not the kind that will sink parts into the ceiling but there are 2 springs under the rocker. Add to your tools needed a parts bowl of some kind. As parts come off its good to take pics to insure your memory is sharp. Its a good time to put them in the parts bowl. I used Tarnex to clean the connector pins on the base. They came out a bright silver, much brighter than they came out. The pics show the munge in the bottom of the switch area. Rubbing alcohol and Qtips made short work of most of it. The wooden BBQ skewers finished off the stubborn material. 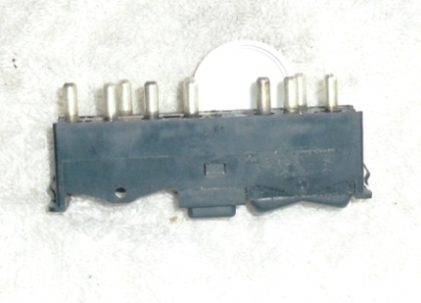 The contactor pieces were next and they too came out bright and shiny as pic 3 shows. Steel balls next along with the springs that are actually held captive with lube inside the plastic rocker piece taken off to get to the switch interior. Make sure the pins that stick up in the switch bottom are all clean. I also cleaned the copper traces which is good if you are visually checking for breaks, other than that its overkill. Last edited by TnBob; 03-27-2012 at 11:10 PM. 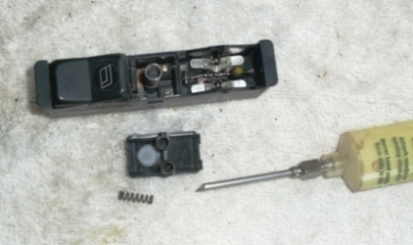 Once you have things clean reassemble by inserting the rocking contactor back in. I also switched ends on these. Turn one over and one contact area will be much more worn than the other. Pic one shows the difference. Drop them in place, add a couple drops of lube and reseat the rocker ball. Clean the plastic rocker and the spring holes in its bottom. I added lube there and put the springs back in. With the switch sitting on the connector pins gently push the plastic rocker down ... back into the switch body. I found it easier to help by using the screwdriver to expand one side and then the other. Test the switch a few times you just refurbished. It should be smooth and snappy. Continue on to the next window switch set. WARNING: The small square switch in the middle of the two window switches has a very small indexer or clicker that take flight if allowed to. 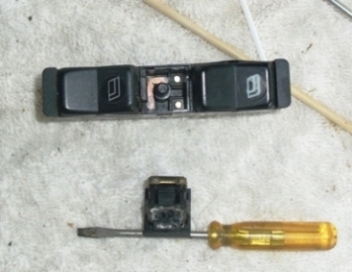 Be very careful as the two switch sliding parts are separated. By small I'd guess it is around an 1/8". Last edited by TnBob; 03-27-2012 at 11:16 PM. Just take your time and be through. If I hadnt been taking pics and answering 5 calls it would have taken me about 10 minutes. 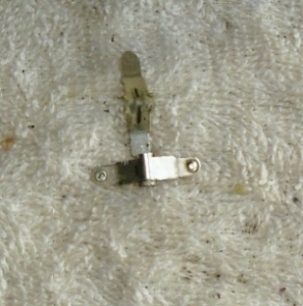 The center switch is removed by pressing in at the top of the opening in the side of the switch housing. As usual both sides need to be done. You dont have to separate the upper half of the center switch. Just the contacts need cleaning. If you do pop it apart, it goes in from the outside in the slot made for it on the side. Last edited by TnBob; 03-27-2012 at 11:39 PM. Great thread Bob - consider yourself bookmarked. But what's Tarnex? Is that some sort of silver polish? And be thankful that Mercedes builds things (used to build things) that can be taken apart, cleaned up, and used for another 20 years. My bad ... I know Tarnex isnt international. Its a liquid (like water) metal cleaner that is sold mostly to clean silver and the like. ~$5 for 12oz here and it works about as good as MEK (methyl ethyl keytone) without the need to be prepared for an EPA attack. Carburetor dip cleaner would be as effective I imagine. Over years I have learned that there is usually a much less expensive more effective way of doing things on vehicles. Tarnex is one of them. Wood BBQ skewers are another. Ebay and yard sales are two more. I picked up a bag full of line connectors from an aquarium outfit. X's T's 90's Inline along with several gate type valves for about $6 delivered. One switch must have been the resting place for coke cans. Hadda pry the parts out of the bottom of the switch housing. Actually soaked the switch housing in rubbing alcohol for bout 15 minutes to loosen the gunk up. Thanks Bob I got the impression Tarnex was something like that - but it is always worth while checking eh? Thanks for the great detailed DIY pictorial. When Iam at PNP, I remove the rear door window switches. the rocker can be removed and put onto the double switch when the window decal gets worn off. This works for the w123, early w201, early w126. the later switch rockers were changed. Good point Charmalu, the console switches sure get the majority of use while the back seat ones are almost virgin. Great tip. 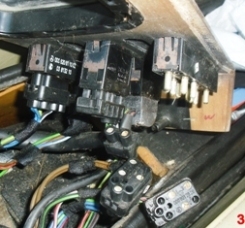 I just went and grabbed the rear switches out of the donor car to replace the console switches on mine before I forget and send it off to the crusher without getting the good switches. Thanks. 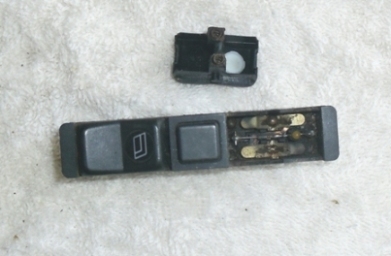 I just cleaned off my hazard switch (working hazard lights are important). It was gunky and green in there. Hazard were dead, and sometimes the turn signals would go dead and I'd toggle the hazards and it would fix it. I just used a small screwdriver to gently scrape the contacts clean, and a little isopropanol. This fixed the hazards and the turn signals. I'd recommend emery paper or fine grit sandpaper. If you just want it working this should suffice. It takes 5 minutes. 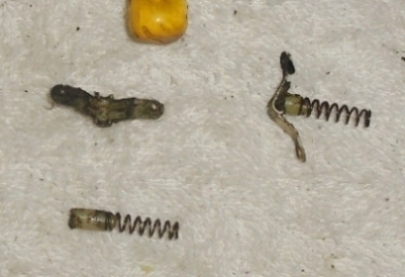 There are two little springs inside the switch so don't lose them. 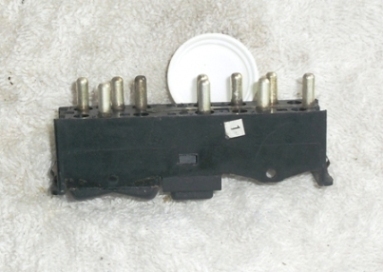 1984 300D Turbo 350K 50K WVO (two tank) "Maeby"
The 2 springs Jack mentioned are usually pretty captive in the switch top which is the part we use. Dont forget the 2 balls that reside in the center of the switch contacts. A trip to anyplace other than walmart that sells cosmetics is a good stop if you plan on doing this kind of work. Nice small tweezers, emery boards of all kinds, itty bitty stiff brushes and even finger nail polish for sealing small screw heads in place. This is a great thread Bob and I don't want to take anything away from it... but he says(!) I found these links on the DIY pages the other day too. I hope they add to the knowledge base.